After the lack of rain in the first half of the year, right through to the tremendous sunshine in early/mid-June, it was a shock to the system to receive six weeks worth of almost continuous rain! It was dreary and dull and very miserable, it gets you down after a while. Even in the winter the sun perks you up. It was heavy too, and by early July the fields and rivers all across the region had cried enough. Roads and rail lines were flooded. 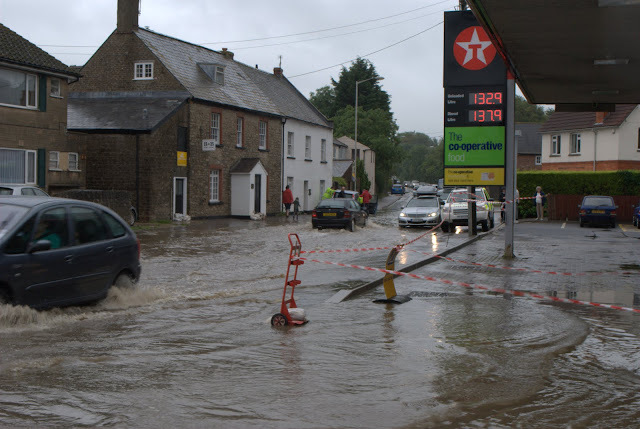 Usually this stuff passes us by in Bridport, we get the wind and rain but little ill effects. And when I heard of problems I naturally assumed it was affecting people in our region but not us. Of course I’d noted the rain but in my 1st-floor flat in the middle of town it just looked like a lot of rain. It was only when reports came of local roads and fields flooding that I realised it had got here! I decided to take a walk with my camera to document it. I remind you this was the 7th of July! Thankfully there was little damage done. I think only a few houses in West Street and the bottom of South Street needed pumping out by the Fire Service – it could’ve been worse. 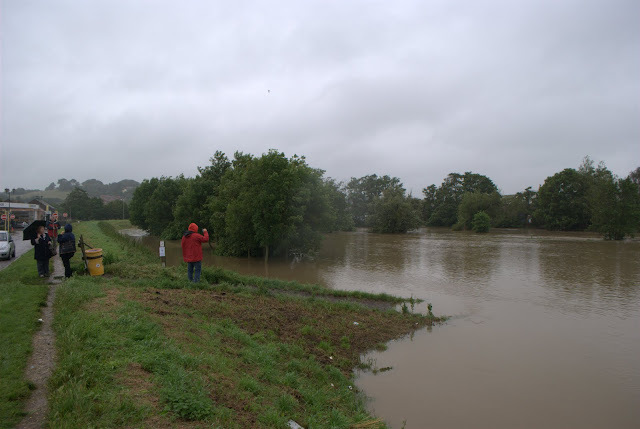 Downstream from East Bridge is Asker Meadow (next to Morrisons), where people go to walk their dogs, and where the river had breached the banks. The cows in the meadow tried to take shelter – and this photo is how the same spot normally looks in a photo taken two weeks later. We came close to losing the beer! Thankfully it was mostly harmless but just a little worse would’ve taken it over the various barriers. After taking this photos I headed home for fear all this water could breach the earth bank I was stood on here, and because I was soaking wet through and wanted to protect the camera! Because the roads were impassable I had to walk the long way around, via Sea Road, just to get to the town centre. Aside from the roads almost being cut off on most sides and the water getting in on the approach roads, the very centre of town was unaffected, being on a slight hill. My place was also completely safe. I was glad I lived on the 1st floor. 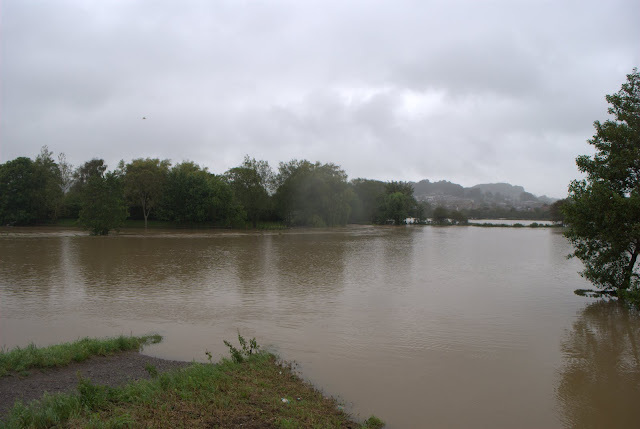 It makes you appreciate not living somewhere that floods more regularly, such as our neighbouring county of Devon. A few months have passed and we had a break from rain for a while. Then in November we had another really big batch of rain, the water table is still high and the fields are sodden. Now whenever we get a normal amount of winter rain, as we’ve had this week, instead of soaking into the ground or into streams and rivers it just runs off on to all the roads making them difficult to pass. To think in April the farmers were complaining about a lack of it! Now they are weeks behind schedule. We just need a clear week or two to let it recover. Author Pat WPosted on December 16, 2012 December 16, 2012 Categories VisitsTags bridport, dorset, floods, weatherLeave a comment on Bridport Floods! In June I took some time off work to enjoy the sunshine and get a few jobs done. I’d spent all my money booking things coming up later in the summer, so I spent this week doing things that didn’t cost very much and one of those things was walking about. On one day I walked from town to a local village and back. The next day, the day I talk about today, I jumped into the car with my camera and headed to the beach. I live on what we now have to call the ‘Jurassic Coast’, marketing-speak for all the fossils and that between Lyme Regis and Weymouth. 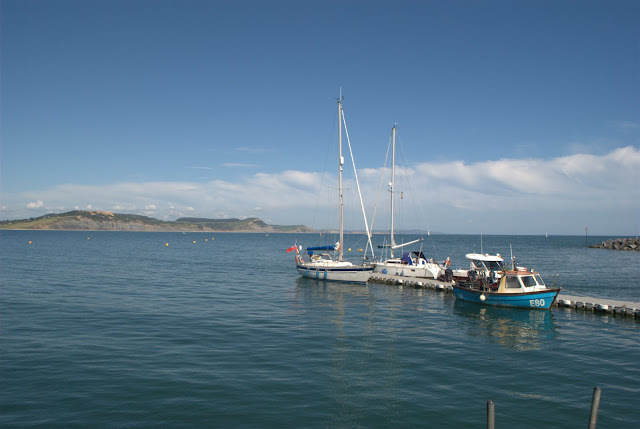 It used to be called Lyme Bay but that seems to be forgotten now. From time to time it does you the world of good to remind yourself what is on your doorstep. 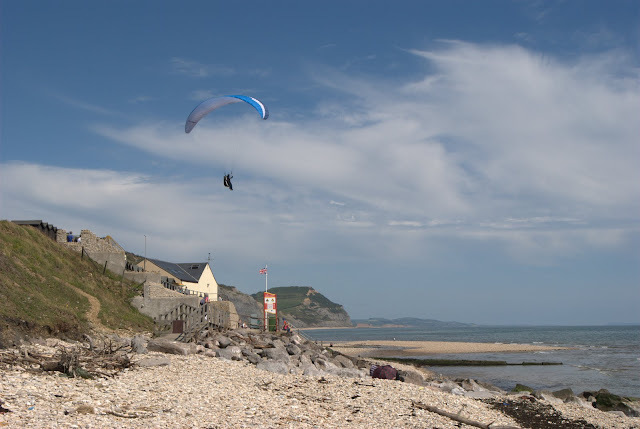 Charmouth is ten minutes from me, Lyme Regis only another five or so (both more with summer traffic). I’m afraid this is going to turn into a series of photoblogs of my summer so if you like that sort of thing stay tuned to the blog! Charmouth is a sleepy village, it has been ever since the A35 bypass took all the passing traffic around the outside of it (thankfully so – it was a nightmare before then and modern traffic levels are far higher!). It hosts a lot of caravan parks for visitors, a few shops, and a beach. You do have to pay to park in the beach-side car park but as that provides for the upkeep of place that’s not unreasonable. 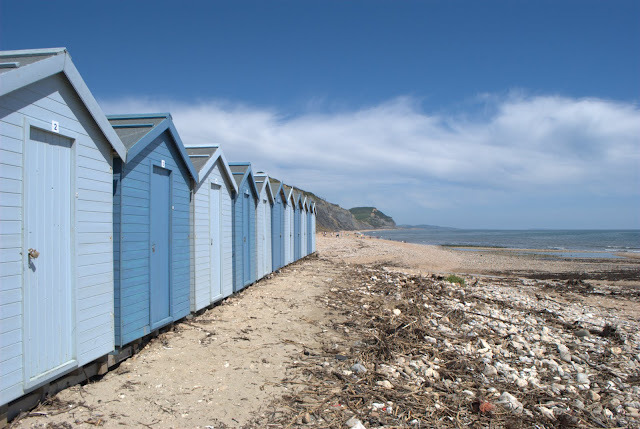 I really like the photo above of the beach huts in a row, in line with the cliffs. This part is actually in the valley between two cliffs. The flat-topped hill is Golden Cap, the highest cliff in Dorset. I like that the huts are sky/sea-coloured, that they are neat and tidy yet the beach is completely natural and not messed about with or tidied up. That’s very West Dorset, and how it should be! Like the rest of the West Dorset coast the beach is very pebbly and the waves make a lot of noise against the stones. Makes me feel at home. 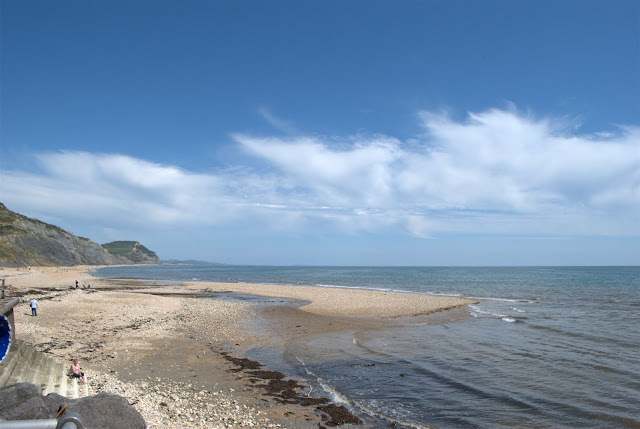 After a quiet little while wandering the beach I hopped into the car and headed to Lyme Regis. If you’ve never been to Lyme, be warned it is quite hilly (understatement). If you prefer a nice amble along the seafront, as I happened to on this day, you can avoid the hills completely (well almost completely – you still have to walk from the car). If you don’t mind the hills, do take a walk around the place to explore. It has been a few years since I was last here and the front has been redeveloped. The most notable change is the raising of the beach level to meet the road – there used to be a drop of several feet. 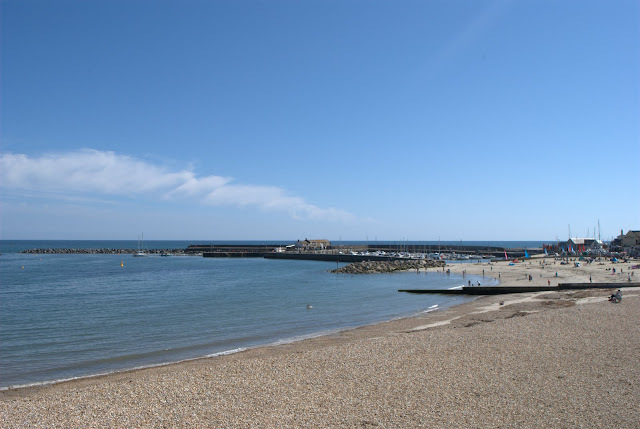 Lyme beach itself is a little different – there is a long pebbly section but then a sandy part by the Cobb (the old little harbour) where you can sit and watch the boats. I really loved the light on that day, not only did it look fantastic it also brought the best out of my camera. I was and still am getting used to my Nikon DSLR. It was a day when I’d be happy to choose any one of many photos to highlight here, and that doesn’t happen very often! If you get the chance to visit the Dorset coast on a warm sunny spring or summer day I really recommend it. Autumn/winter is okay but it really does come into its own on a warm sunny day when people have got their boats out. Just amble around with a camera with the sun on your back. I’d not had a day this relaxing in a long time. You can see the full set in my June 2012 album (which is actually just photos of June 19th). I rounded up the day with a few photos of my town, Bridport. It was evening by then, not that it looks it, and it gets quiet midweek evenings. The bunting was up for the Jubilee and the Olympics! 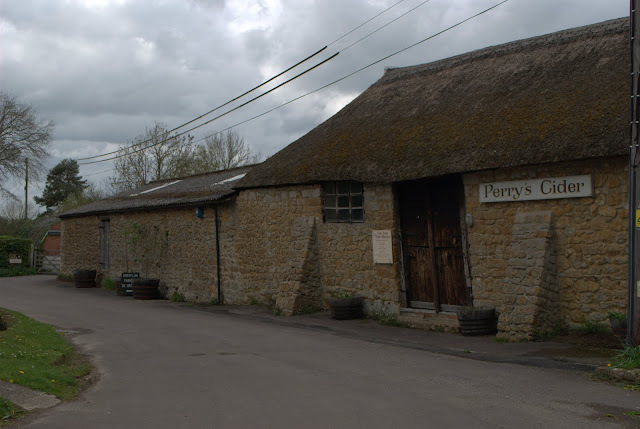 I took a day off for something which was then cancelled, so rather than waste the day a few of us took the opportunity to head to Perry’s Cider to have a look around their musuem and have a bit of a sample! The works and museum are in the quiet village of Dowlish Wake, out in the countryside somewhere near Ilminster. Even wandering slowly it doesn’t take long to look around the yard and the building housing the old machinery. I think they still use the machinery either for demonstrations or production runs, so if you go later in summer/autumn you should be able to watch them work. For us though the place was very quiet apart from the work going on in the adjacent bottling plant. We arrived at about 1pm and after a bit of a walk around we thought it was a good time for lunch before looking in the little museum. The site has a modern yet sympathetic thatched building containing a tea room at one side and a shop at the other. I can heartily recommend lunch at the tea room! From the specials board we all had a beef and mustard baguette, warmed, with a big salad and Burt’s Crisps. I cleared the plate. Lovely! Malcolm and I both love an apple crumble so when we saw the apple and summer fruits crumble on the board for £3 we had to have that too, with custard of course. Out comes this big portion with a liberal amount of custard, all nice and hot – I was getting full but had to finish it, it was so good! One of the other highlights was the ability to buy a half or a pint of draught cider from the shop to accompany your meal. 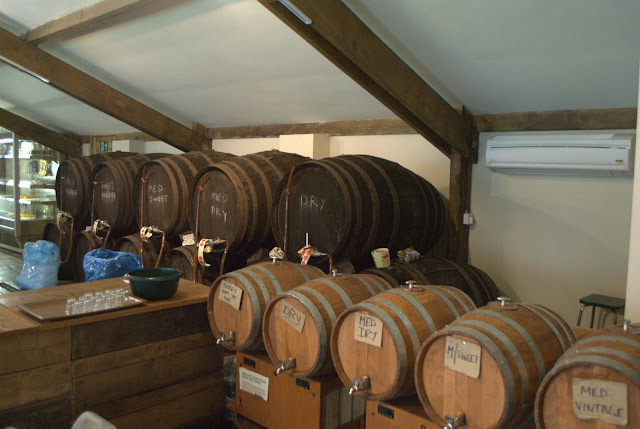 Of course, to know which cider you wanted you had to sample some from each of the 5 or 6 barrels..
Suitably stuffed we took a casual walk around the shop, lots of stuff there, the usual ‘farm shop’ foods and condiments as well as gifts and suchlike. Personally I was only really interested in the ciders! 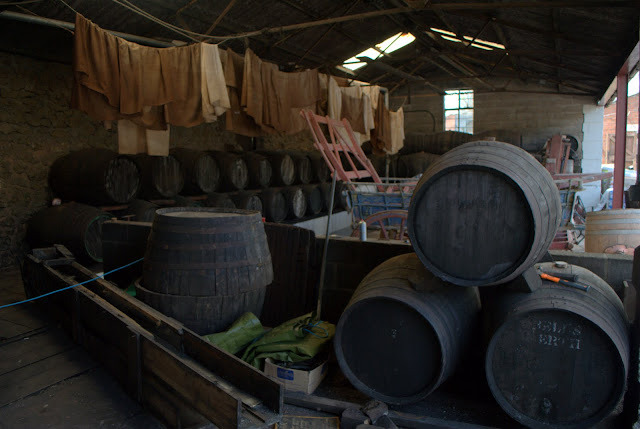 I walked off with a 4-litre tub of medium dry, that’s about 7 pints, straight from one of these huge barrels for the princely sum of £7.75. Naturally, after my pallette was coloured by the food I had to sample each of them again – and those from the many bottles – in order to choose the one I wanted to take away, after all, you have to remain properly informed. Next to the production building is the old works which now houses a small museum of old bottles, jars, hand tools, a huge bellows, and all manner of other tools from 80-100 years ago! Sadly my photos from in here didn’t come out well, I’d messed up the camera settings after judging the light wrongly, and perhaps I was still suffering the effects of a few too many samples! After that.. what better thing to do than to go back to the tea room for a nice coffee? The wander around the yard and the museum is a nice relaxing way to spend a bit of time, but the tea room is worth the visit alone. Despite actually not being a whole lot there, we somehow managed to while away a good 2 or 3 hours and it didn’t feel it at all. A great relaxing way to spend an afternoon. I recommend it. Take a look at my other photos here.